If you don't know what to get the girl who has everything, this is one of the rarest bags in existence. This Friday, December 11, Christie’s is holding their inaugural live auction in New York of handbags and accessories, so prepare your wallets. The auction will have 223 bags from Hermès, Chanel, Louis Vuitton and Judith Leiber. These are rare exotics, limited editions and one-of-a-kind bags. Below, see the top must-have bags, so you can choose your favorites before they’re on view to the public at Christie’s Rockefeller Center galleries. Happy holiday shopping! Hermès Amethyst Porosus Crocodile Birkin with Diamond Birkin Hermès, 2013 (Photo: Courtesy Christie’s Images LTD. 2015). 1. The Diamond Birkin: This bag is touted as “the pinnacle of an Hermes bag collection” and estimated for $100,000- $150,000. It’s crafted from “Porosus Crocodile,” a saltwater croc from Australia that’s known for its refined scales, making it the most expensive skin. The glossy bag was buffed with an Agate stone so it can shine bright like the diamonds it wears. The Diamond Birkin has a total carat weight of 8.077, along with a white gold padlock with 40 diamonds and a total weight of 1.64 carrots. Hermès Matte Himalaya Nilo Crocodile Retourne Kelly with Palladium Hardware, 2014 (Photo: Christie’s Images LTD. 2015). 2. The Himalaya: Its name comes from the delicate gradation, which is said to resemble the snow-topped Himalaya Mountains. The current estimate is $60,000 to $70,000. If you don’t know what to get the girl who has everything, this is one of the rarest bags in existence. Hermès Shiny Amethyst, Bleu Izmir & Bleu Jean Nilo Crocodile Constance Bag with Palladium Hardware (Photo: Christie’s Images LTD. 2015). 3. Hermès Shiny Amethyst Constance Bag: If the Birkin is a little big for you, this shiny amethyst bag with hardware will chicly transition from day to night. Pair it with an amethyst Birkin for a seriously stylish gift for a fashion-obsessed mother and daughter. Hermès Blue Jean Swift Leather Kelly Flat Bag with Gold Hardware, 2007 (Photo: Christie’s Images LTD. 2015). 4.Hermès Blue Jean Swift Leather Kelly Flat Bag Bag: Don’t be afraid to pair dark denim with this blue jean Swift bag, which looks like something Taylor Swift would love. It’s more relaxed than the diamond encrusted Birkin, but it’s detailed knot still makes it stand out. 5. 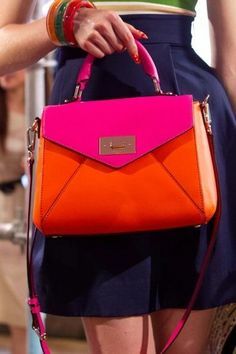 Hermès Special Order Horseshoe: This pink and orange purse might remind you of Marc by Marc Jacobs bags of seasons past, but this one is going for an estimated $15,000 to $20,000, making it far from an M by MJ. The Horseshoe stamp signifies that it is a one of a kind creation, custom made for a top client, so it’s a truly exclusive Birkin bag. While it wasn’t exclusively made for you, no one has to know that.